Finding a suitable Instant Tent for your next camping trip is a demanding task, especially when we are overwhelmed by choice. We are often given the ultimatum to decide between an Ozark Trail or Coleman, maybe even a CORE instant tent. We’ve taken weeks and weeks to create an extensive list of the fast pitch tents available on today’s market. Some are slightly older and still going strong and we also have some new up and coming models that are definitely worth a peep. We have mainly focused on comparing 3 of the top brands who manufacture tents with pre-attached poles, also known as instant tents. To find out which model and size is worth our money. First up the Coleman Instant Cabin, boasting the most sales in this category, with a huge percentage of happy users. With a fast pitch and lightweight feature it makes this a viable option for a 4 man tent. The material is 150D polyester which is a decent material and does the job. Secondly, the seams are also taped to increase protection against water penetration. Surprisingly, even being a Cabin shape, which has reasonably high and straight walls, it stands strong in the face of wind. Coleman have their WeatherTec System installed. So that includes their patented floors that are welded and inverted seams that offer consistent protection against the wet. With a footprint of around 8 x 7 foot, its generous and quite wide for a 4 man when compared to other models. The center height is 4.10ft, which is pretty standard for a cabin design. When packed up its dimensions are 38 x 18 x 9.5 in which can probably fit into an average sized car or tied to the roof-rack. It still remains a fairly lightweight instant tent with a 8.5-9 lbs weight. A single large door takes precedence at the front of the tent and as you can see from the pictures this model is surrounded by mesh windows, the air circulation is superb. They also do a great job of keeping out all the bugs too, the holes are too small for them to fit through. Firstly it has a great fast pitch system. Making it one of the easiest tents to set up in the 4 person range. Its quick and easy set up system with pre-attached poles allows it to erect quickly up unpacking. In less than 60 seconds. It also has a rain fly that is integrated with vents to aid air flow. This example is here because of its unique feature and family style design. In fact its one of the only decent Instant Tents with an awning you will find. It’s a waterproof, ventilated and well designed, let’s check out its features. It measures up at 94 x 98 in inches and has a surprisingly tall center height at 175 cm. Its a fair weight at 10lbs, this still qualifies as a lightweight tent in our books. Additionally a 3 season tent, so can be used the majority of the year round, avoiding heavy snowfall on the awning to avoid damage. Including storage pockets, which is always useful for storing important possessions, away from the groundsheet. 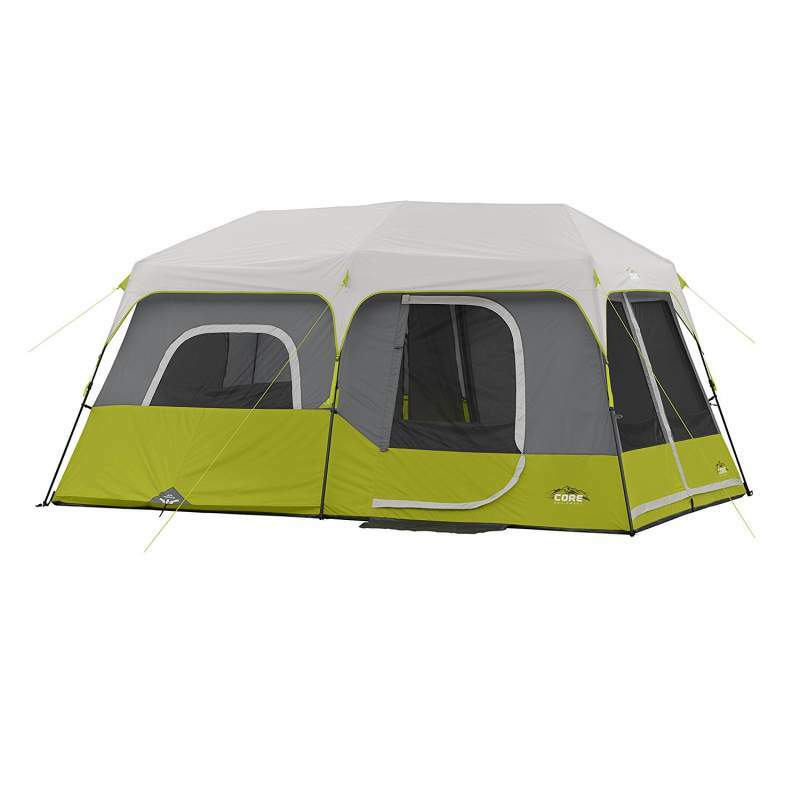 It has a covered vestibule and additionally an awning, which attaches to the front of the tent. Providing added shelter and a cool place to sit away from the sun. Lantern hooks are also integrated internally, to attach camping lanterns or lights. The floor is sturdy, made of 150D oxford fabric, its a good quality material for resisting water. They have also taped the seams and covered the zippers to improve resistances. It’s well ventilated with double meshed windows, which also serve as protection against bugs. Rain fly is also vented, so you can pop it open for extra circulation, even during light rain. As we mentioned earlier, you can also vent the ground floor by propping the rear vent outwards. With pre attached poles, its a fast set up tent and very easy to pitch. It has a ‘smart’ locking mechanism at the top/center of the tent, its nothing we haven’t seen before, but functional, which is important. One great tip for this, when you are securing it to the ground, it has a flap at the rear you can pull out and stake down. This creates ground ventilation, which circulates air underneath, this can be quite useful to clear out accumulating condensation. Over all a quick set up and can be done by 1 person. Its an easy set up tent with similar dimensions to the Coleman Instant Tent, however it is smaller in some areas. It does have some additional features though, that the others don’t. So lets look at this model in more depth. Its definitely an easy pitch tent, for us it went up in around 45-50 seconds, and can be set up alone without difficulty. With no assembly preparation needed, all pre attached, this tent is an instant pitch. Just unpack the tent from the carry bag and then unfold it into shape, extend until you hear the click. job done. Surrounding the tent are 3 large windows which provide great circulation and visibility, on the 4th side is a large sized door. The windows and doors are all meshed, providing protection from insects and improving ventilation inside the tent. The framework itself is made of steel, which is better than fiberglass frames. Fiberglass is indeed lightweight, but steel is stronger and less prone to breakages. Fabric is made up of polyester, fairly breathable material and moderately resistant to rain and manufactured with a waterproof membrane. 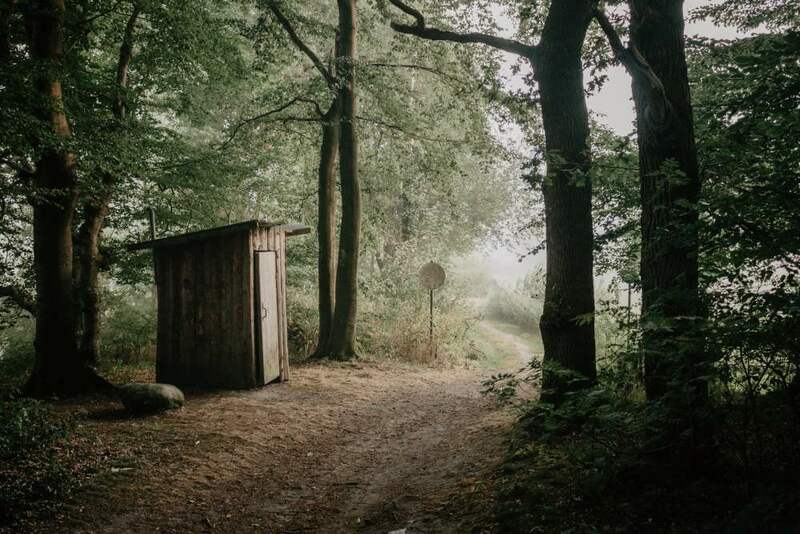 The dimensions stand at 10 x 9 feet, which is indeed identical to the Coleman Instant Cabin. However, the center height falls short at 5.5 foot, whereas the Coleman stands at 6 foot. This is something to bear in mind if you are a taller camper. 10 x 9 is indeed spacious for a 6 person tent and has plenty of room to store a queen airbed, a few sleeping bags and or camping gear. A really nice feature on this tent is the electrical cord access. In a modern world Ozark has taken the initiative and put something practical in to suit modern campers needs. Also the rain fly is included in this model, along with a portable carry bag and enough tent stakes to get it set up properly. CORE enters the fray with their take on the 6 person Instant Cabin Tent. They actually did a very good job with this creating a reliable option for casual family camping. Boasting bigger dimensions than both the Ozark Trail and Coleman 6 person models, its worth a peep. So here we go. Coleman 10 x 9, Ozark 10 x 9, CORE 11 x 9! 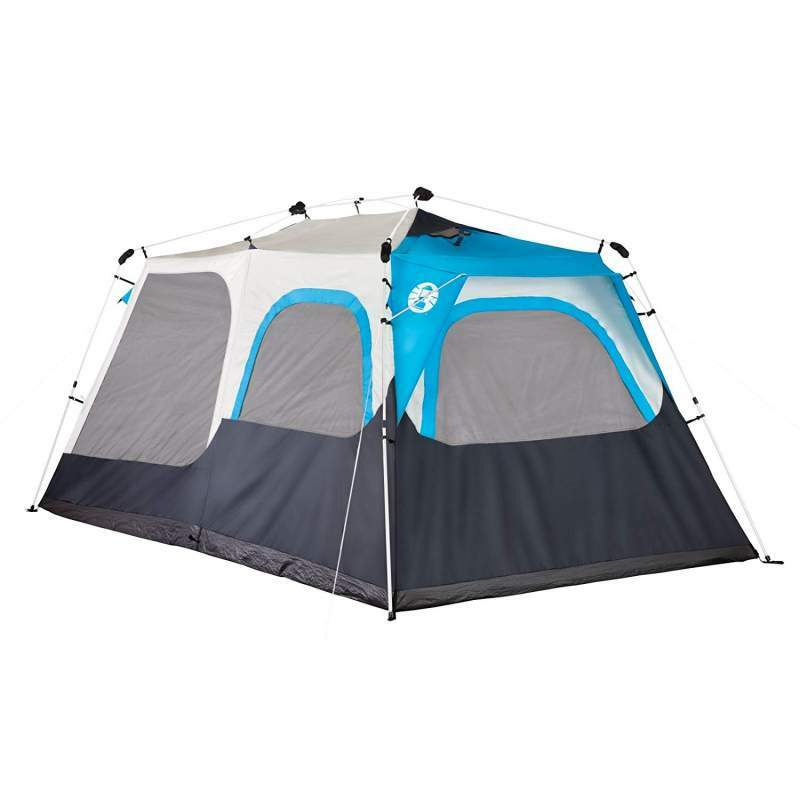 The CORE instant tent takes position with a slightly larger than average 11 x9 floor plan. Slightly extra space to fit in an extra bed and gear. Center height however, is a different story. Taller than the Ozark, although, it stands side by side with the Coleman 6 man. Using CORE’s H20 Block Technology which has a few features worth mentioning. The fabric is waterproofed with a repellent membrane to keep it dry. It then also is manufactured with sealed seams and the rain fly is fully taped up offer additional resistance. Certified fast pitch tent, sets up instantly within 60 seconds like the other models, so it doesn’t fall short here. As usual unfold the structure and extend the framework outwards until it clicks. The frame will now be automatically fixed and ready, you can then secure it further with the tent stakes and guy lines, after rotating to the correct position. As all the models are free standing, you can position at will. All the windows are fully meshed for bug protection and ventilation. Also they have the ground ventilation feature like the Easthills model, which is great for ground floor circulation. Like the Ozark they also have a electrical cord access port which can be closed when you’re not using it. One great thing is the storage, they have a ‘wall organizer’ which is a whole wall dedicated to storage. Perfect for keeping things up off the floor. It also has a gear loft and lantern hook so you can connect some LED lights. This is a great improvement of the 6 person from Coleman, but extra features come with a higher price tag. The dimensions are also a little larger than its predecessor. The highlight of this fast pitch Coleman has to be its superior center height. Standing tall over the other similar sized tents with a center height of 6.2 foot tall. The measurements of the tent when pitched is the norm at 10 x 9 foot floor plan. Its a portable fast pitch tent which weighs in at around 22 lbs for trail weight. When packed up its a little on the large side and wont fit into a standard backpack, so you would need to carry it separately over your shoulder or strapped to our back. No assembly of a frame is needed, the poles are pre-attached by design. It actually sets up smoother than its predecessor, probably due to the dual bubs in the center of the framework, it makes a smoother and faster assembly point. A little more sturdy also, feels less fragile. Up and pitched within 1 minute. The framework is very resistant and durable as it has been coated with protective powder. The frame is also made of steel. While being slightly heavier than the aluminum or fiberglass frames, its much stronger and will last longer in retrospect. Unlike the cheaper Coleman instant tent, this one does come with a rain fly, and not a tacky one either. Its made of 150D polyester material which is considered heavy duty, the rain fly itself is also factor sealed for extra protection and durability. Also Storm Flaps have been integrated into the design of this instant cabin and an adjustable roof. Aiding in ventilation and dealing with precarious weather conditions. Lantern loops are fixed in the interior, at the ceiling position, so you an attached some camping lights. This model comes in 3 color options. Blue, Black and Brown. This is probably the best selling instant tent out there, reliable, durable and when used with the rainfly and tarp floor, can withstand rain well also. Lets look further into why this one is a winner. 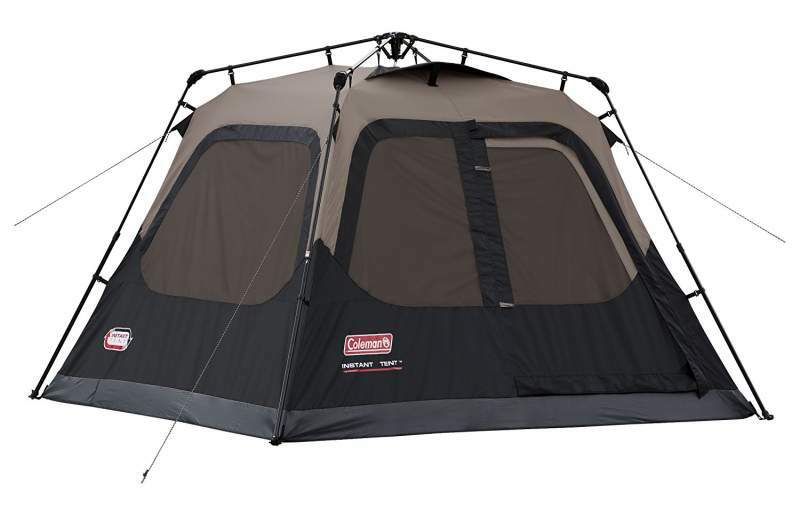 Coleman have made Black, Blue and Brown Instant Tent models for this design. They do all have the same floor size, at 14 x 10 feet. However there is some difference in the center heights. The Black and Brown models have a center height of 6.5 foot. However, the Blue instant tent is apparently taller, at 6.7 foot high. We would suggest you double check this with Coleman before buying. It is a waterproof tent due to the polyester material and weatherproof membrane in the fabric. However, you always must make sure you have checked whether or not he rainfly is included. If not you will definitely need to use one on this tent or you will not last the night in rainfall. It has a removable divider, you can use this to create separate space inside, great to keep the kids busy in the corner, or privacy when in a group. 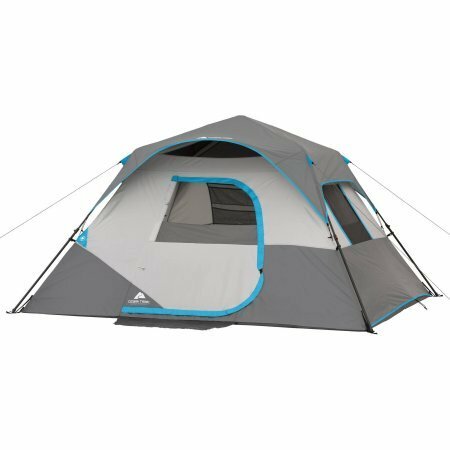 Designed with 2 large doors, this helps to keep the tent organized, using one as a fixed exit and the other as the entrance. 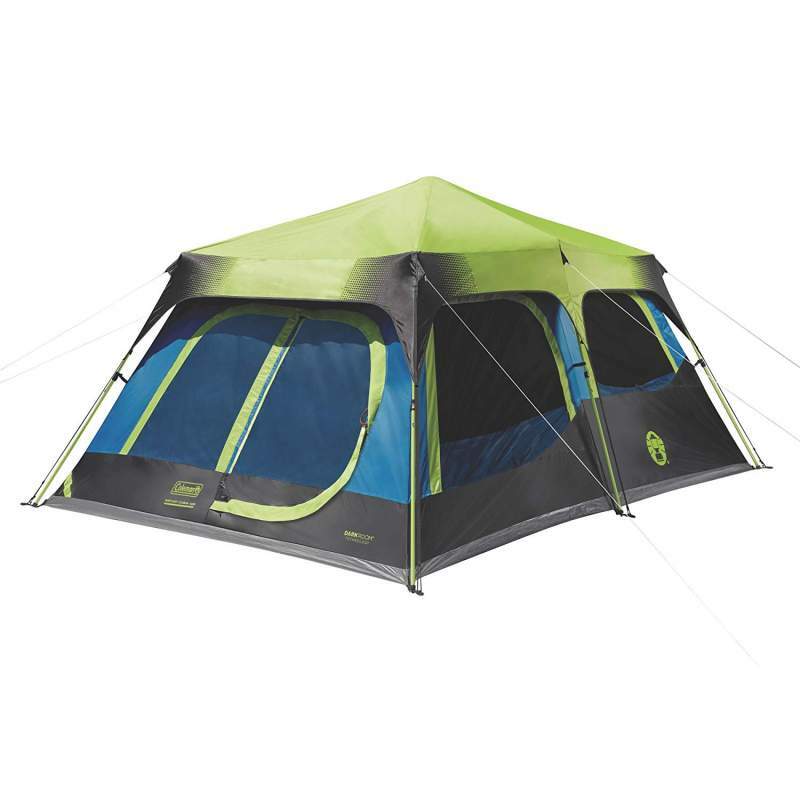 As well as 2 doors, this instant tent has 7 windows, providing excellent ventilation throughout the whole tent, and 360 views. Easily assembled and secured in 1-2 minutes depending on the amount of people setting it up. These tents can be set up alone smoothly, usually in around 2 minutes. Take from the package, unfold, extend poles until they click into position. Rotate for position as they are freestanding in design, then secure with tent pegs and guy lines. A great family camping tent with a fast pitch design and easy set up. Lightweight and portable, it can be used for any casual camping trip and resist light rainfall. This model stands at 13 x 9 foot compared to the 14 x 10 of Coleman. However, the 6.6 foot center height is an inch taller than the competitors in the list. Only 1 door, but its huge, 2 adults could walk in and out at the same time easily. 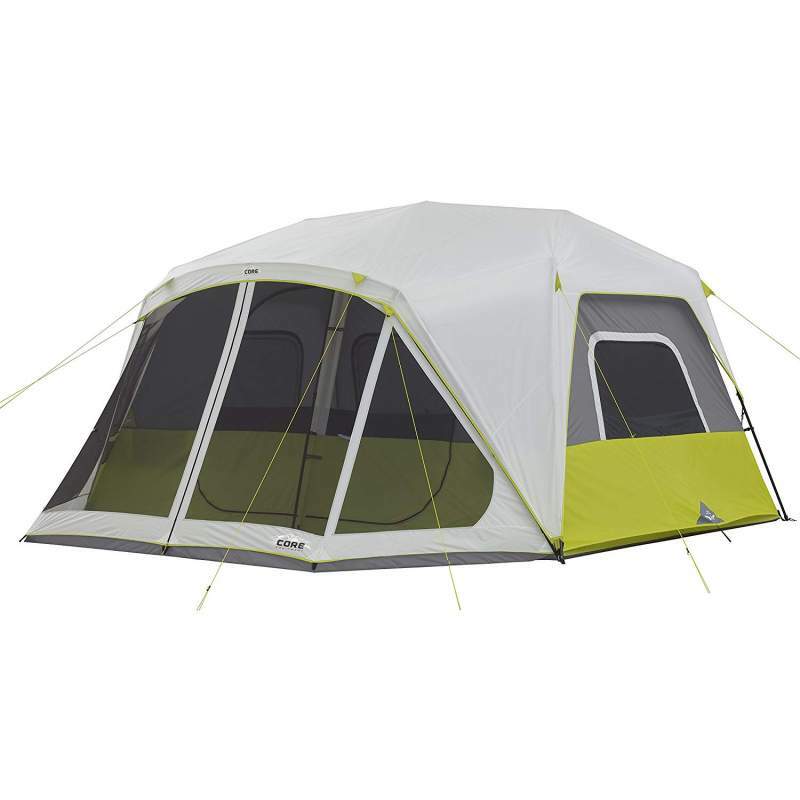 It has 4 windows, 1 for each side of the tent, which keeps air circulating fairly well. 4 meshed windows keep it mosquito free and cooler in the day. A removable divider helps to ‘create’ the presence of 2 rooms. So, you could attach the divider in the center, and use the other side as gear storage or changing area etc. Like the other models you simply need to unfold it, extend the framework outwards until it clicks into position and job done. Attach the rain fly after this, then secure with tent stakes in the desired position. It is a waterproof tent, but we suggest you use some seam sealer or waterproofing spray if you can. This particular model weighs around 24 lbs and can be carried inside its carry bag. It’s a freestanding tent, so it can be positioned and rotated freely, prior to securing. 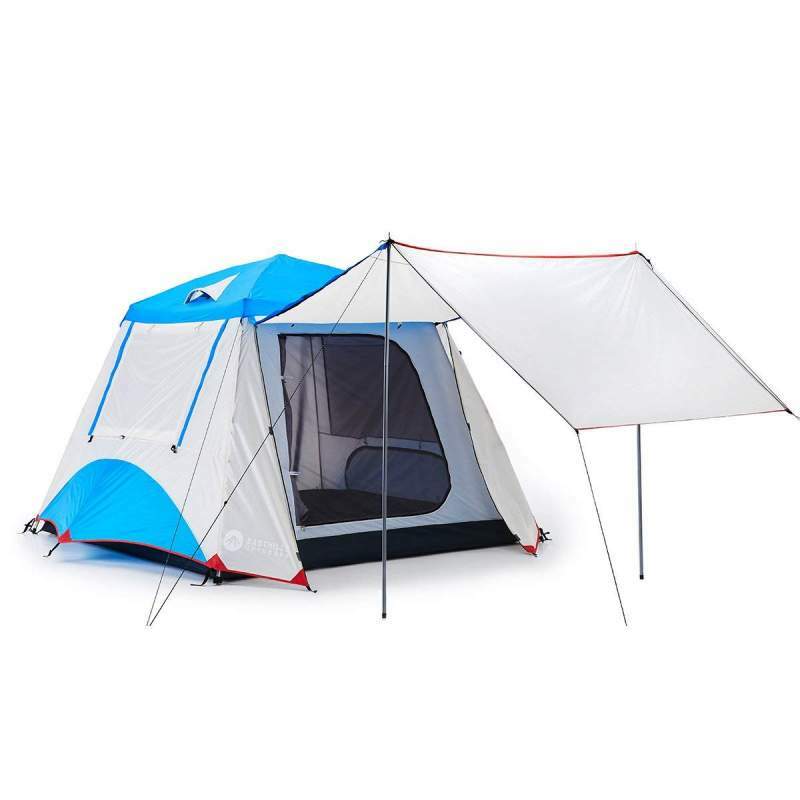 With free rain fly, tent stakes and carry bag, it is also fitted with an AC port for electrical access, which is a welcomed feature for the bigger family tents. In this category there only stands one champion, the CORE 9, a best seller for them and a great instant cabin tent for family camping. Standing at 14 x 9 foot in measurements, its bigger than the previous Ozark Trail 8 person. The center height stays competitive standing tall at 6.6 foot at the hub. Being a cabin tent, it has straight walls and a box like room design. As opposed to instant dome tents which have a lower head height generally and rounded walls. It also has a divider like the others, so we can create 2 sections inside the tent. Manufactured with Core H20 block technology, what this focuses on is providing water repellent material that can withstand the elements. This technology includes an active bead technology, what this does is force the water droplets to run off at a faster speed than usual. This allows less time for the droplets to soak into the fabric. Rain fly is removable and reveals a panoramic mesh window and mesh ceiling alike. The rain fly is fully taped to add to durability. The door is a large double door, which assists in the air circulation, also allowing easy access in and out. The venting system is clever, designed to pull in the cool air from the ground level, via the adjustable air intake vent on the bottom of the tent. Meanwhile, the hot air is able to escape through the roof of the tent via the meshed ceiling and windows. Firstly it has the AC port access installed to make use of those important electrical items. The divider to separate out the tent to allow for better organization and space utilization. There are also zippered privacy panels integrated into the doors and windows. Lastly, all important storage pockets are included. There are hanging pockets that are installed in the interior. 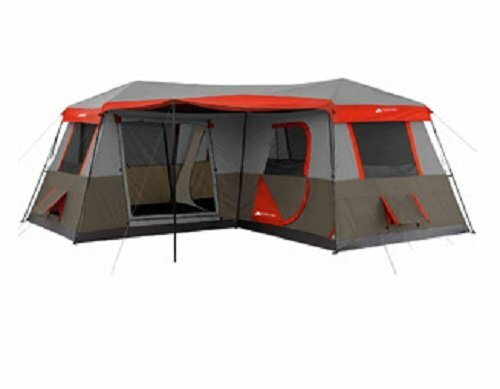 With a very unique color scheme, Dark Room technology, WeatherTec System and Tub shaped floor, it sets itself apart somewhat from its traditional counterpart.With larger dimensions, stronger frame and heavy duty tent fabric, it outdid the traditional tent hands down. Standing stronger in the battle versus CORE and Ozark in this category. It blocks up to 90% sunlight, perfect if you are camping with animals, children or perhaps you are slightly sensitive to the sun. Dark room technology drastically reduces the heat from the suns rays. Reducing the buildup temperature by around 10%, which is substantial if you are dealing with high temperatures. It also has a sleep inducing effect in the evenings, as you sleep in total darkness. 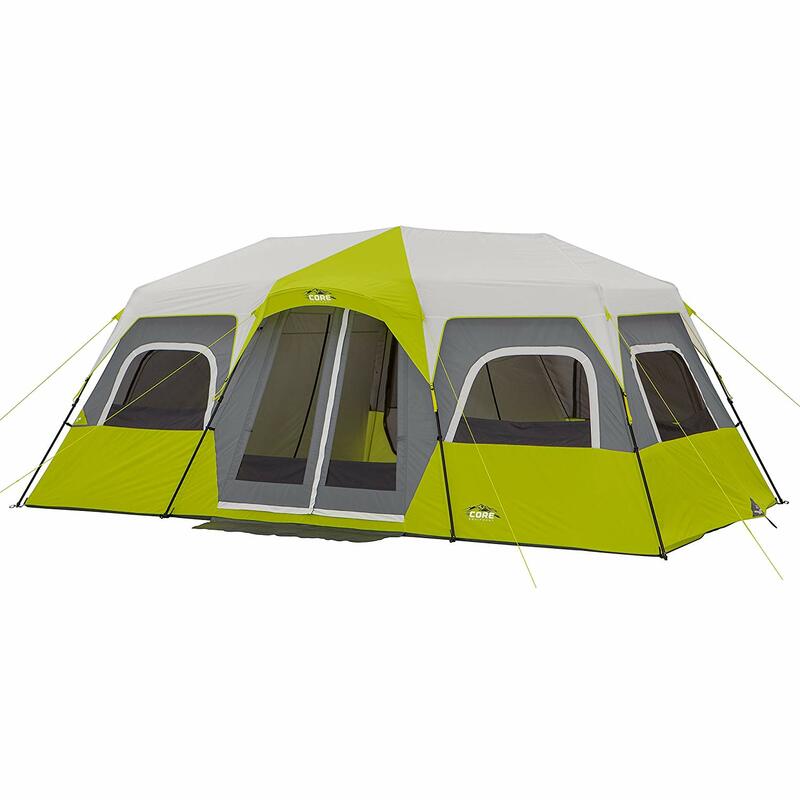 A very unique color scheme, this instant tent has a Green, Black and Teal pattern combination. The light color rooftop helps in reflecting somewhat of the suns rays, while the dark room interior gets to work on reducing the inside temperature. 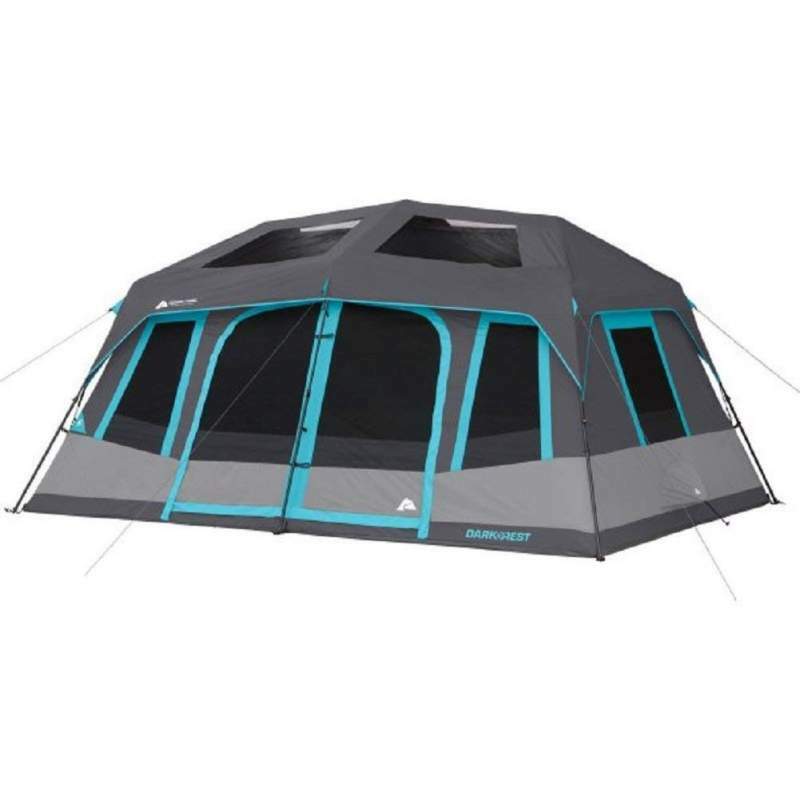 The Teal is integrated into the windows and doors area of the tent, and the black laces the bottom and the corners. A very sturdy steel frame that has been engineered to withstand wind speeds of up to 35mph. It stands at 14 x 10 foot by measurements and has a center height of 6.7 foot. Its also still bigger than the CORE 9 Person and the Ozark Trail 8 person, in dimensions and center height. 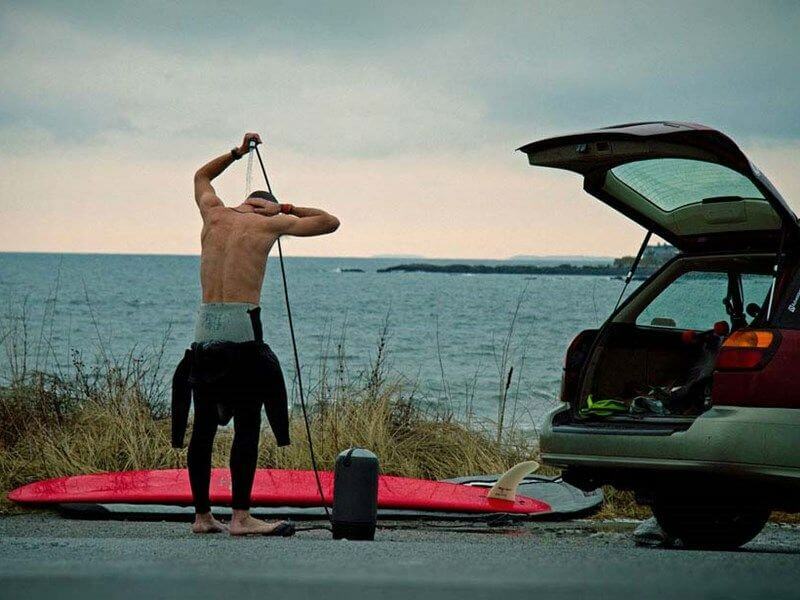 Given the size of the tent it becomes challenging to pitch alone, but its still possible. However, with an extra pair of hands on board, this will still pitch easily in 1-2 minutes. Folds away nicely into the elongated, rectangular carry bag. Its not too difficult to fold alone, you will need a bit of practice first though. Id suggest trying in your garden first, before your trip. Due to the WeatherTec System integrated into this tent, it can stay dry under moderate rainfall. It has patented corner welds which stops encroaching condensation at a ground level. It has a tub style floor and also protected seams on the zippers and doorways to keep it dry in weak areas. This is the best 10 person instant tent around in our opinion. Vastly out-sizing the Coleman and Ozark Trail models. It has great dimensions, a superb design and a host of features that are missing in some other models. Its dimensions are 14.5 x 14 foot, this towers over the Coleman’s 14 x 10 dimensions. The center height stands tall at 7 foot so as you can imagine the inside is spacious and there is plenty of room for a large group. The front screen room is attachable and its 14 x 5 foot in diameter. It rigs to the top and connects over the front of the framework. The area inside the screen room does not come with a floor or ground sheet, so i suggest laying an extra sheet or tarp down beneath. Its meshed and has a large zipper in the center, separating the large double doors. Spacious rooms due to the size and also the cabin tent style, having tall straight walls rather than the curved dome style. It also comes with a divider so you can separate it into a 2 rooms. Because of its size this works well and can separate the tent into 2 handsomely sized spaces, one for sleeping, one for changing. Then use the front screen room as storage. They also have storage inside in the form of a long pocket attached to the side wall. Includes thermally taped seams to ensure water resistance. Additionally complete with ground vents to circulate the cooler air beneath, and hot air is able to escape through the center via the meshed ceiling. Lastly it includes a compression wrap and free carry bag to add to the package. 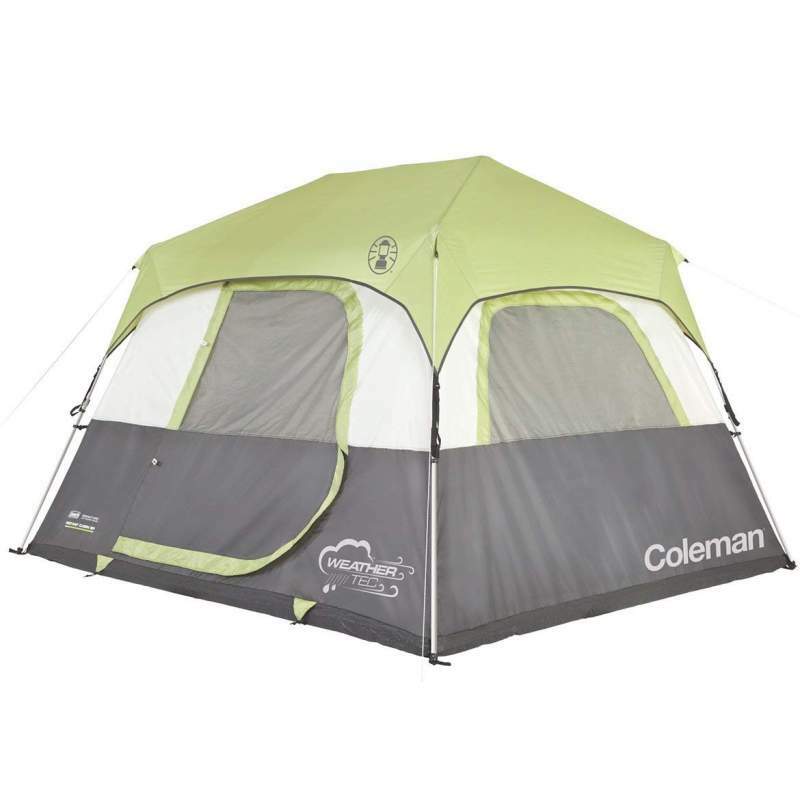 Designed as a Dark Room tent, it is very similar to the Coleman, but there is a considerable price difference between the two. Albeit reputation and quality are factors that can separate these 2 brands, however it does make for a decent family camping tent that pitches instantly. An easy and fast pitch tent, perfect for family camping when you just want to get it done, and fast. We set this up in around 2 minutes with 2 people. It was easy as the whole framework is connected already and the poles are pre attached. With a huge amount of windows, 8 in total, it is well ventilated like a Gazebo. The door is a large double D shape in design. These are all meshed as well which prevents any bugs getting in. Additionally they provide some great views and you can really take in the surroundings with a 360 degree experience. Ceiling panels are movable so you can adjust your view of the night sky in the evenings, just roll them back when you want to stargaze, then fold back and secure when its bed time. 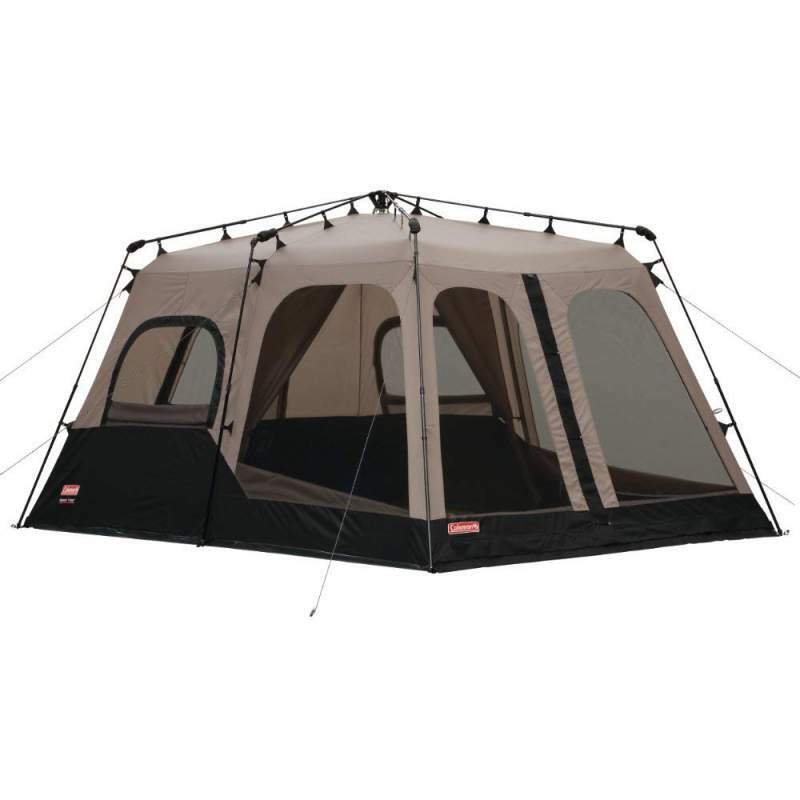 Here is where the similarities kick in with Coleman’s 10 person dark room instant cabin tent. The dimensions are identical both at 14 x 10 foot. Although the Ozark Trails head height is slightly lower than the Coleman’s at 6.5 inches, its around 2 inches shorter. It also has the Dark Room technology, so this offers another cool space to rest in and also a better nights sleep. Keeping in line with its smaller models, it maintains a lot of the properties as seen in the other models. We will talk about what’s new and what’s not here. Its measurements now stand at 18 x 10 foot. This may seem smaller than the 11 person model, which has a 17 x 12 foot footprint, but remember, that is because of the attached screen room. The 18 x 10 foot measurement you see here is the tents dimensions in its entirety. With less attachments to be made to the frame, it’s a more compact tent. Thus, more resistant to strong winds given the aerodynamic nature of the design. The center height stands at 6.6 inches, which is surprisingly lower than the 11 person. One nice feature to this instant tent is that they have fitted 2 doors instead of one. This is really important when we are dealing with the larger tents. It keeps things organized and cleaner if you fix one as the entrance and the other as the exit. All the windows and doors have been fitted with privacy flaps, which is practical when changing inside the tent. The double doors allow for great ventilation also. Generous storage in the form of 4 pockets on the interior wall. They have the usual gear loft, which is essentially a larger, elongated pocket along the other wall. There is also a feature for you to hang an LED or battery powered camping lantern from the hook attachment inside. It is possible to turn this tent into a 3 room tent. This is a really nice customization feature for a larger tent. With the abundance of space it is a good idea to use it as a multiple room tent, rather than 1 big open plan. 2 removable dividers allow you to separate the tent into sleeping area, changing and even gear storage area. All in all it’s a great option if you want something just a bit bigger than the 10 and 11 person models. Another reason is the ability to divide up the tents space accordingly, providing security and privacy within the large spacious rooms. 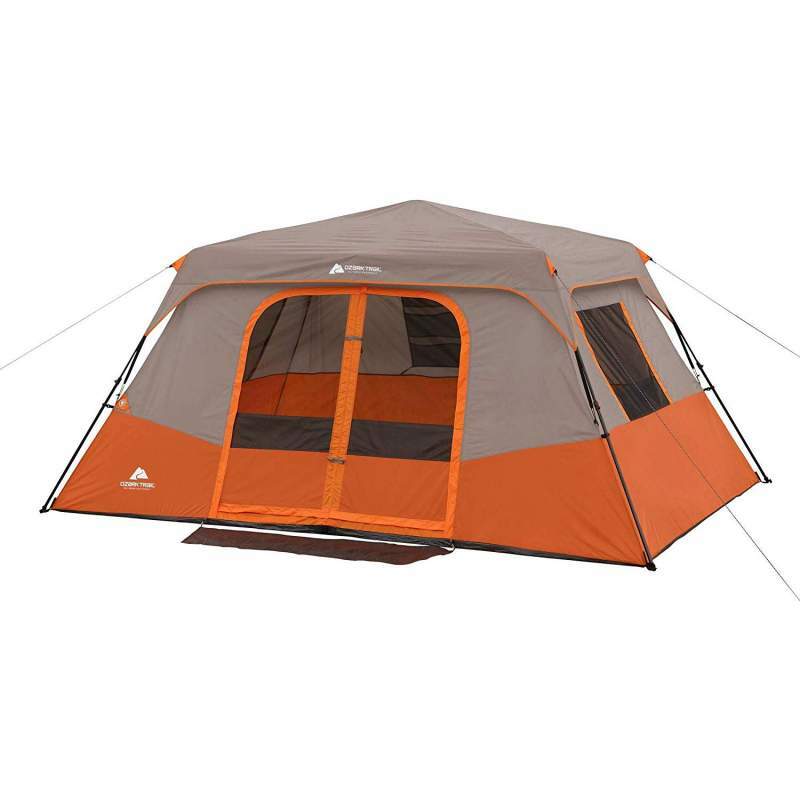 The last in our line up, the largest instant tent in our list is the 12 person from Ozark Trail. With massive space and 3 rooms it’s a beast and suitable for family camping trips in large groups. Also comes with a large shade area on the front which could be used for a camping table and chairs. The rooms are 8 x 8 foot in size making an accumulated size of 16 x 16 foot in total. It’s a monster. Big windows on all sides to aid in the ventilation of such a large tent. Fitted with 2 internal room dividers allowing you to divide up the space accordingly and keep the interior organized. A large front awning attachment covers the entrance, great for relaxing in the shade on a hot day. In addition, a large ground vent allows cool air to flow inside freely. With a shipping weight of around 61 lbs, we would say the carry weight is around 55-57 lbs. A large attachable rain fly covers the entirety of the rooftop and also comes free with the purchase. A power outlet exists as a feature, function of the power outlet is to electrify the outside of the tent, this is to prevent any larger animals approaching in the night. Bears, mountain lions, cougars etc can be common in certain areas and may be attracted if food is left out. It’s a good tent, but it’s definitely not without its faults. They have integrated a triangular covered screen over the front awning. We feel this could have been designed a little bit better as it can cause some annoyances during heavy rainfall, due to the angle of the drain-off. The tent material is also thinner than the CORE and Coleman large instant tents, i would definitely suggest reinforcing this one with proofing spray before taking it outside. The head height is quite low too, standing at only 6 foot, its lower than most of the 8-11 person models. What is an Instant Tent? They are generally lightweight, waterproof tents that can set up within 1-3 minutes. They do this by utilizing a pre-attached frame which requires no assembly. The frame extends outwards in unison until you hear the click of the locking mechanism, this means the tent is now fixed. After this you simply need to fasten and secure the tent with tent stakes and guy lines. Attach the rain-fly to protect from rainfall and your tent is pitched. You then simply unfold this bundle and the pre-attached frame in the form of interlinked poles, will rise up in unison to form shape. It’s pitched. Then attach guy lines and stakes for security, job done. Easy right? How do I Fold an Instant Tent? They mostly operate on a ‘hinged pole’ system. We simply need to ‘unhinge’ the tents frame poles, then bend them back over the opposite way. Back towards the center hub. Once all poles are folded back towards the hub, like a pack of straws, roll it up tight. Then place it neatly back into its carry bag, its as simple as that with no folding involved. Mainly rolling and keeping the tent air free for a tight packing is the key factor for easy storage. Instant Cabin Tent vs Instant Dome Tent: Which is better? A Cabin tent would be longer to assemble and a bit more demanding. This is due to the larger frame and size. Dome tents tend to be smaller, more compact, therefore easier to set up. A Dome tent would be lighter, generally speaking. A Cabin tent is often bigger with much larger rooms and interior, this brings additional weight. It would also be the case when both are collapsed, a Cabin would weigh more and have a larger storage area, a Dome would be lightweight and easily carried. Cabin Tents have straight, taller walls that resemble a home. They often come with curtains or drapes to attach to the interior door lining, to create a nice feel of comfort. Also equipped with windows and doors to ventilate the bigger size rooms. Dome Tents tend to create more 4 season tents than with Cabin Tents. This is because of the nature of the camping locations it is used in, you can get access to more remote locations with its lower head height and compact shape. They will be exposed to more extreme weather conditions than a Cabin. While a Cabin sits with a bigger family at a casual camping area. The difference in shape also impacts the interior size. Being a Cabin, it has straight walls, which leads to more space inside the tent. The Dome, is rounded in shape, so the walls center in at the middle, this creates a curve meaning less space inside. This isn’t a negative or con, on the flip side it means you can pitch it in more discreet locations, under trees, canopies etc. You can start to see now that there is a clear reason for each design and they shouldn’t be used for the same purpose. Yes, for the most part. Some of the cheaper models will need some extra protection in the form of proofing spray and seam sealing. Also, some other economical choices are just not built to handle strong weather. The CORE and Coleman instant tents are generally well waterproofed and with a rainfly can survive easily during rainfall. We should always bear in mind to check the Hydro Static Head Rating of a tent to make sure its high enough for the environment you will be camping in. 1000mm-2000mm will be enough for the casual and family campers out there. If your question was not included in our FAQ, please comment below or email us on our contact page. Instant Tents are a great addition to your camping trip and they offer suitable shelters that can be used for various group sizes. They are slower to set up than the Pop Up Tents and a bit more hefty to carry around, however they are far more robust and provide larger size models. A reliable and economical option to consider for your next adventure, that will also save you time and a potentially a headache when you arrive at the campsite. Hope this was insightful and helped you to make the right choice for your trip. Until next time campers, cheers! 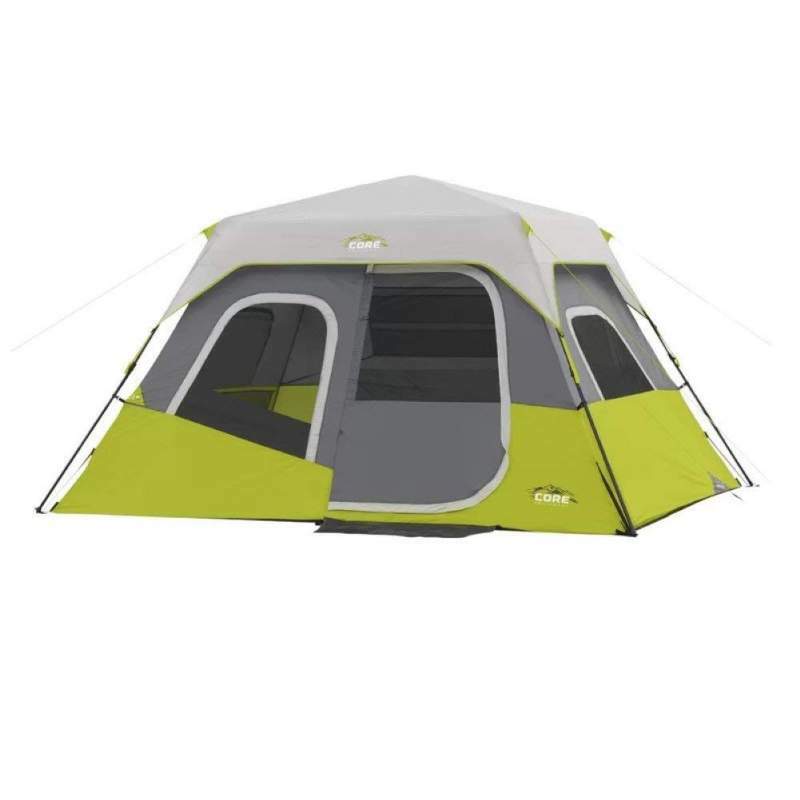 Hi there, I’m looking for the best 6-person instant popup tent, and it seems that the Coleman’s 6-person instant tent with fly and Core’s 6-person instant tent with awning are the best choices. How would you compare those 2 with each other? Thank you very much! I think awnings are hard to come by with the 6 person models, and if you can set up your tent in a position where it wont be ‘wind-disturbed’ too much, i’d take the awning all day long. The extra shaded/waterproof spot will pay dividends in the long run, also providing a nice homely environment for base-camp. My 2 cents.